Other then the fireplace itself, what really makes the room come together? Some would say that it’s larger furniture, such as a couch or a cozy armchair, but we like to think the little details make all the difference when it comes to the big picture. For example, with the right area rug or well hung picture you can change the entire look and feel of the room. So, now that we have decided the little details are extra important, where do you start? Well we have picked out five really important decor items that can give your room and living space a whole new look. You may have noticed a new trend in home decor world, blanket ladders! Not only are blanket ladders a great way to display your favorite cozy throws and knits, it also gives you a great space to organize them without taking up valuable floor space. A blanket ladder is also the perfect piece to accompany your Valor Fireplace, because really what’s cozier then blankets and a roaring fire! You can create your own DIY blanket ladder with a few simple supplies, or find one at your local decor store. Baskets may be a great option for organizing, but that’s not all they’re good for! Have you considered storing some of your favorite items in baskets and putting them on display instead of hiding them away? The key is to mix and match your basket style between wire and wicker to get a designer look without the cost. Add in your favorite items such as pillows, blankets or maybe even some comfortable slippers for your visiting guests. Not only will it make for easy access when you are ready to use these items, it will also add a whole different dimension to your room and Valor Fireplace. Not everyone considers an area rug as a must have decor item, but once you have one you’ll see what you have been missing! When you are dealing with a living space that isn’t carpeted, you want to bring in a comfortable factor in the center of the room. By adding an area rug, you are giving your room a central home base and providing some unexpected warm comfort for your family and guests. No matter big or small, an area rug will make all the difference. As you can see in the example below, adding a small yet striking white sheepskin rug brings the neutral tones in the room together. 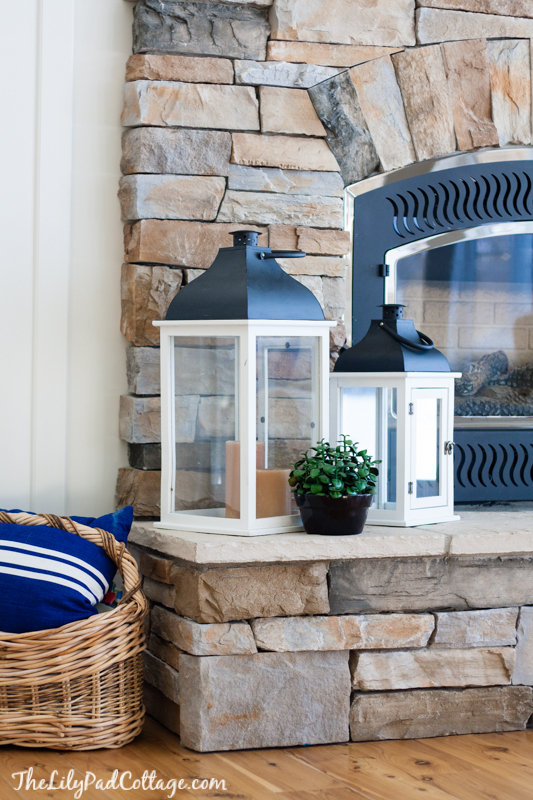 When you think of lanterns, your mind may go directly to the patio or deck area. But long gone are the days where outdoor decor has to stay outside! Lanterns are a great way to bring a modern edge into your living area and highlight the beautiful lines of your Valor Fireplace. By adding candles or battery operated lights to these lanterns, it also allows you to bring an extra soft light source into the area. Try grouping different shapes and styles in groups of 2 and 3 to get different looks. Also, don’t be afraid to get crafty and change the color. With a quick paint spray, you can have a new look every season. 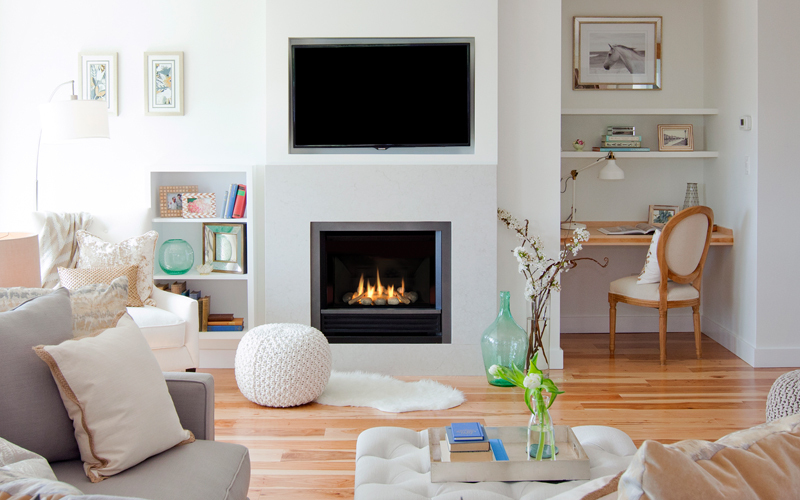 Trying to decide what to hang over your Valor Fireplace can be a difficult task. You could hang anything from artwork, a television or our personal favorite a mirror! We love the mirror idea because it can take a small room and make it look expansive in a matter of seconds. The reflection from the mirror will give your room a bigger and lighter look, even if it’s not really that way. As an added bonus, adding a light in front like the example below only increases that effect and lightens your room which is great for rooms without natural light. Play with different styles and textures until you find the mirror that matches your space perfectly. What is your must have decor item? Share it with us below!